Increasingly, we meet with the statement that should be excluded from the diet of milk or milk products, because we are allergic to them. However, in the Czech adult population is allergic to milk protein affected only 0.5% of individuals. Cow, but to the same extent as goats, or sheep's milk contains proteins that are potentially characteristics of allergens. This means that in predisposed individuals immunopathological response capable of inducing type I IgE-mediated. The main allergens are milk and lactalbumin lactoglubulins. "The mechanism of allergic reaction is the result of very complex processes. Among them fall genetic disposition and individual immune reactivity, which is being built primarily in infancy. Very simply, we can say that an extra element of protection against the development of immunopathology represents breastfeeding, "says prof. Dr.. Jan Krejsek, PhD. the project plus white. Breast milk is absolutely unique in its composition and significantly differs from animal milks. The fundamental difference is the high content of complex carbohydrates, which are known as prebiotics. Prebiotic sugars are indigestible to humans directly. However, they represent ideal growth substrate physiological intestinal microbiota. It sets a very positive mucosal and systemic immunity and determines to a high degree of individual immune reactivity with a large protective effects on the emergence and development of allergies. "A significant influence, particularly with regard to food allergies, including a solid diet of infants. Solid food should be breast-fed infant is given no earlier than the 4th and no later than at 6 months. At this time in the intestinal mucosa set tolerizing mechanisms to ensure compatibility of allergenic food ingredients in life, "says the professor. It is true that cow's milk allergy is the most common food allergies toddler and early childhood, which affects up to 3% of children. Manifested most skin eczema. Clinical manifestations may also affect the digestive system. With regard to the substitutability of milk in a healthy diet is positive that most affected occurs with increasing age of the disappearance of clinical symptoms of milk allergy. Most children grow out of it metaphorically. In the adult population suffer from allergies to milk only about 0.5% of the population. Even in the affected population are differences. Someone eg. Not tolerate raw milk, but fermented dairy products or cheese does not cause him difficulties. The condition of digestion of milk is the decomposition of milk sugar, lactose by lactase. Unless quenched lactose is fermented by the colonic microflora to form a gas. This translates digestive problems, flatulence, diarrhea. Lactase activity in adulthood is missing only in Etnica Asian (Chinese, Japanese) and in the black population. "Quite different is the situation in Indo-European population. Its basis is etnogenetický in pastoral population of West Eurasian steppe preserving lactase activity in adulthood. These individuals were evolutionarily significant advantages because of the milk received a high-value food. Individuals with lactase activity with greater certainty lived to adulthood and pass on this positive quality offspring. We belong to the population, where the loss of lactase activity - that is the cause of lactose intolerance - in adulthood reported in 10% of the population, "says the expert. From the above it is clear that the claim of blanket intolerance of milk in adulthood with us, have no rational basis. They are the result of uncritical acceptance of information that is especially true in Asian Etnica. In addition, dairy products, which arose naturally lactic acid, ie. Yogurt or cottage cheese, or were obtained renneting are therefore distributed lactose or it does not, because these products may be consumed even individuals suffering from lactose intolerance. "Our population is genetically disposed to allow it to enjoy milk throughout life. 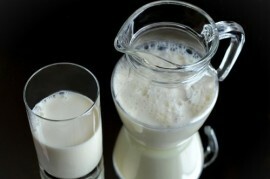 Consumption of milk and dairy products is to our great advantage metabolism and is beneficial to health. Milk and fermented milk products positively intervene in the regulation of immunity. Strengthen our defenses, positively affect the intestinal microbiota and prevents the development of immune diseases, "adds Professor. Dr.. Jan Krejsek, PhD. the project plus white. More information can be found at www.bileplus.eu . Hospital in Ústí nad Orlicí a new babybox! Frequent dilemma - you know, for whom a claim?